5 Bulbs/Croms. These are SO COOL. If you like unusual plants and rich color, you will LOVE these plants! These start with the purple/red foilage which really adds a PUNCH to any container or garden spot, but it doesn''t stop there! These have pastel pink to white flowers that really contrast wonderfully with the dark foilage. These are a great addition in the garden or grow in containers so you can enjoy these plants all year long! 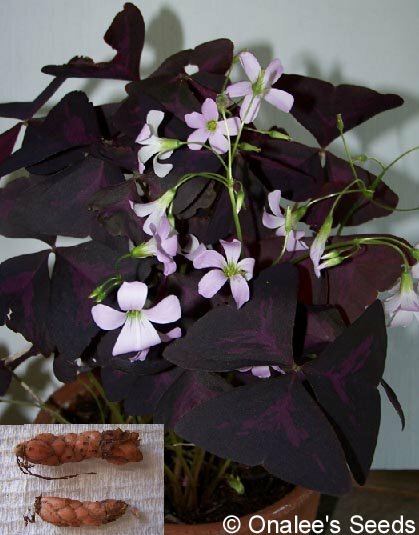 You are buying 5 Nice Big (1/2 inch - 3/4 inch long) bulbs (really these are croms or rhizomes more than bulbs - see photo) of Purple Leaved Oxalis, Wood Sorrel or Shamrock plant. (Oxalis Regnellii 'Triangularis'). These are SO COOL. If you like unusual plants and rich color, you will LOVE these plants! These start with the purple/red foliage which really adds a PUNCH to any container or garden spot, but it doesn't stop there! These have pastel pink to white flowers that really contrast wonderfully with the dark foliage. These are a great addition in the garden or grow in containers so you can enjoy these plants all year long! 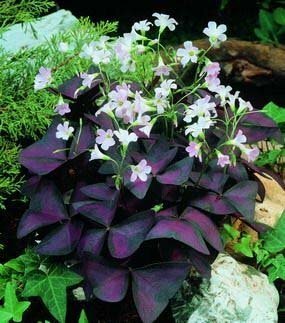 These plants have purple to purple-red, three-lobed, triangular, shamrock leaves and little flowers that range from white to light pink. These bloom from spring to fall (or all year long if you bring them inside!). Grow these in bright shade in the hottest zones full sun in cooler zones they are so easy to grow it will amaze you! Grow inside or out, they look great to fill in under taller plants (these will reach about 7 high) or as a container plant all on their own. These add a really nice splash of color in the garden or in containers! These are hardy in USDA Zones 6-10. They make EXCELLENT house plants, growing very well in containers at home or the office. BUY MORE AND SAVE! Check the drop down box near the top of the page to see the discounts! These will be shipped via FIRST CLASS Mail.